Do you remember how it felt like the first time you did it? Have you really thought about it before doing it? Was it scary? Was it something you won’t forget while you still live? So, how was your first sleeping-in-the-airport experience? It scares me so much that I haven’t tried it yet. 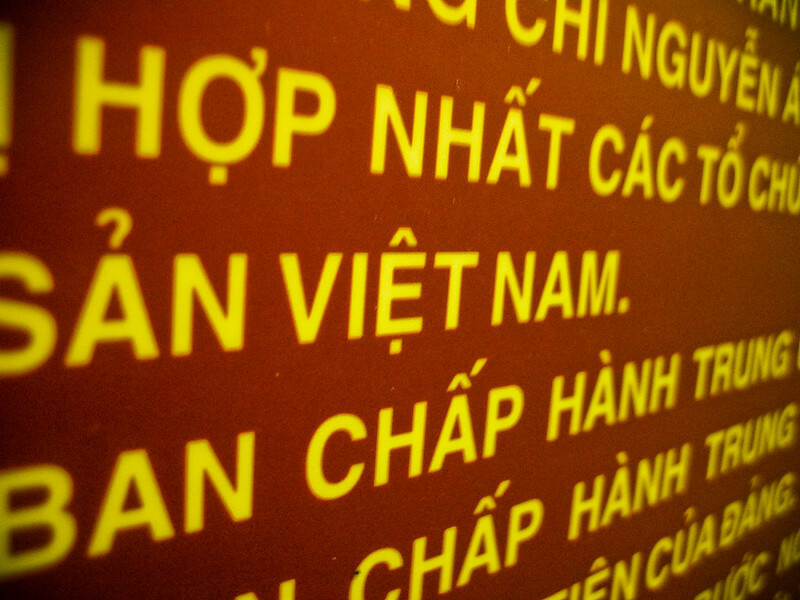 We arrived in Ho Chi Minh City’s Tan Son Nhat International Airport pretty late. Uhm, scratch that. The plane landed at 1 AM. It’s just my second trip abroad and have read horror stories of travelers being robbed so please don’t blame me if sleeping in the airport wasn’t just an option for me just yet. We paid for a lodge where we didn’t need to lie on a cold floor and be half-awake all the time. After we got ripped off by a taxi driver, we reached De Tham Street of District 1 and immediately looked for our lodge. It wasn’t easy to find, I tell you. A lady of I-don’t-know nationality approached us and asked us how she could help. We told her we were looking for Anh Dao Guesthouse. As we were searching for the said lodge, a city local saw us and led us to where the lodge is. We thanked the foreigner and then she left. Now here’s the funny thing about this lodge. We didn’t know that it closes before midnight so the local pounded the door hardly enough that the people inside were awoken and opened the door for us. And here’s the part where the local asked for a tip. We didn’t give him any because we had no spare money as all of our Dongs were already scammed by the taxi driver. We just said sorry. 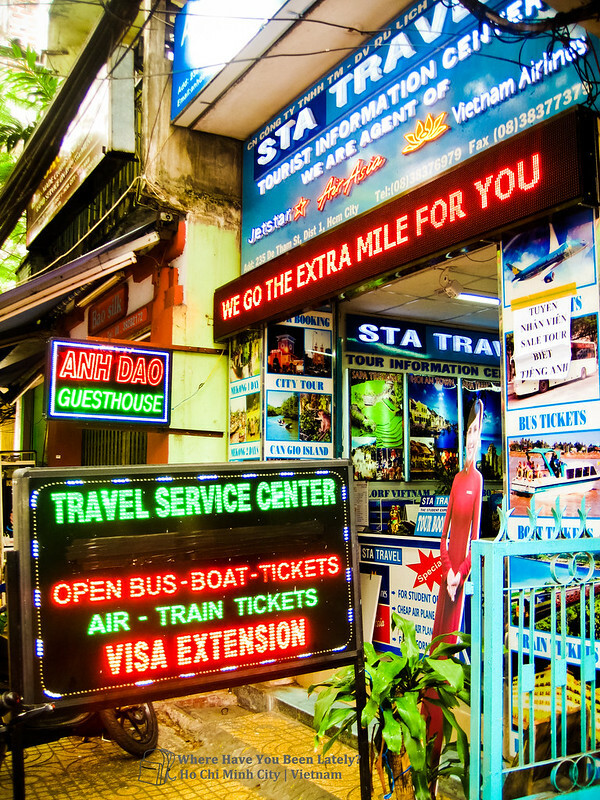 The lobby or ground floor of Anh Dao Guesthouse is a travel agency (Sta Travel) at day time. They apologized for last night’s incident as they didn’t know we were arriving THAT LATE. They also arranged our bus transfer to Phnom Penh for only $20. I’ve read from forums that usual rate is $12 to $14 per person ($24 to $28 for two). The entrance of the guesthouse-slash-travel agency. The ground floor transforms into travel agency at daytime. The guesthouse itself is relatively small but the room we occupied is decent in size. It’s clean, has fridge (with free bottled water), closet, a safety box, wall-mounted TV, and a veranda overlooking the De Tham Street. The exact room we occupied. With a veranda and view of Đề Thám Street. Rowjie who’s quite healthy didn’t like the bathroom though. Sure, hot shower is working, it’s clean, and complete with the basic toiletries and but it’s really small. I’m sure other travelers who are far more gigantic than us won’t appreciate that as well. A little bathroom for little people. The $14 (Php 625.97) rental fee was worth it. 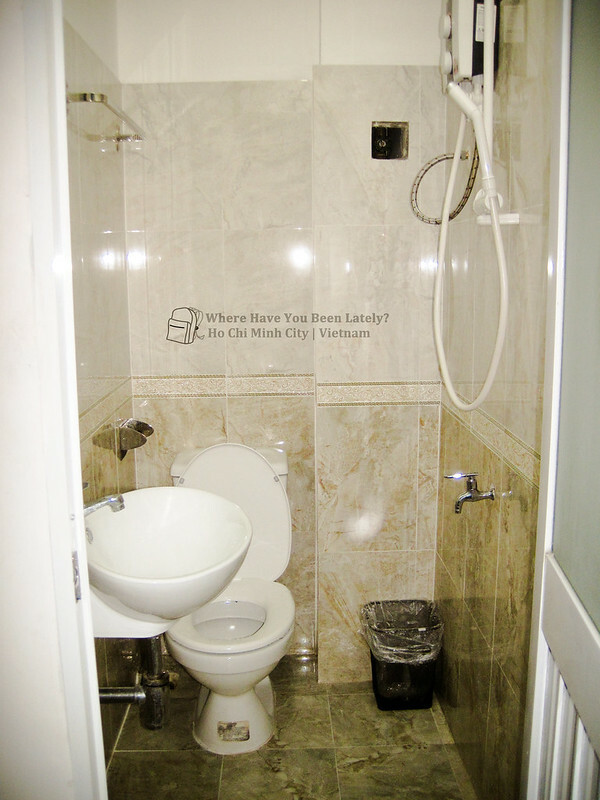 The lodge is near the Reunifcation Palace, Ho Chi Minh City and War museums, the Ben Thanh Market, and other must-visit places even the Saigon River. 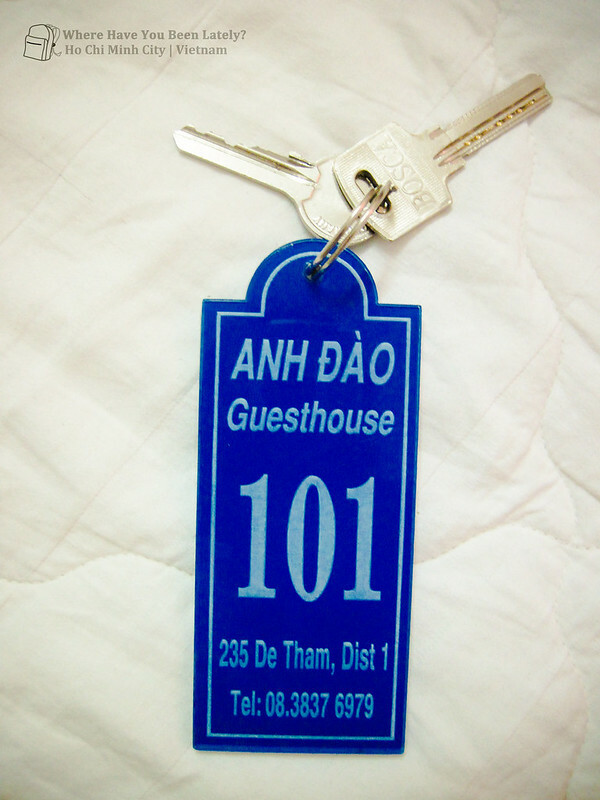 In Anh Dao Guesthouse, guests are requested to leave their shoes and flops at the lobby before entering their rented rooms. 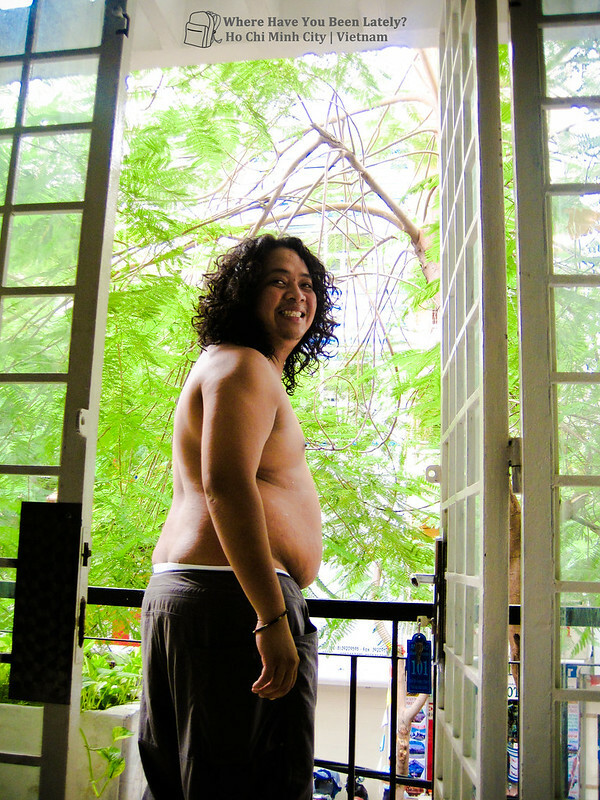 I thought it was a peculiar Vietnamese practice until we arrived in Cambodia. I still need to contemplate more on whether I’d sleep in an airport in the future. I might enjoy the comfort that lodges bring. But if I do, I want my first time to be memorable. Ang cool ng Title mo Ms.Kaiz.. hehehe..
mura daw talaga accomodation sa vietnam.maganda yung room.